With a presence in more than 60 countries, ArcelorMittal is one of the world’s leading steel and mining companies. They supply quality steel to the major global markets with the aim of producing safe, sustainable products. To create a very high impact piece that appeals to both specifiers and the steel manufacturing industry, showing the potential and capabilities of steel for construction. Gives the specifier unique, tactile, physical experience of materials, textures and colours. Underpinned throughout by beautiful application photography of finished sites. 1100 copies were produced in 7 languages and distributed to major architectural practices and manufacturers in around 10 countries. 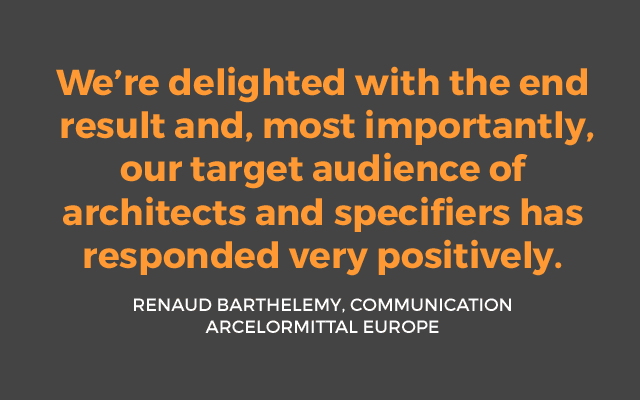 Feedback has been very positive and substantially boosted ArcelorMittal’s presence as a supplier to the specification end of the built environment.